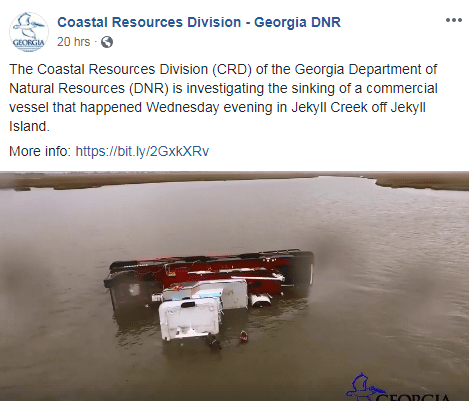 Jekyll Harbor Marina assures CN that you can navigate around the capsized tug which is near G 19, north (thank you Bruce Hildreth) of the Jekyll Island Bridge and Jekyll Harbor Marina, A CRUISERS NET SPONSOR. Obviously, extreme caution is required to navigate the Waterway’s narrow and shallow channel through Jekyll Creek, a longtime Problem Stretch. Our thanks to James Newsome for this alert via Bob423’s Facebook page. Correct location of capsized boat is about 1 mi north of Jekyll Island bridge. It is lying just out of the channel in shallow water.